Sagrada Familia is the most impressive sight in Barcelona and trip here is a absolute must on any visit to the city. Antoni Gaudi started building this incredible church in 1882 and it still isn’t finished! Much work has been done in recent years however and the crazy curves and mosaic topped towers are now really starting to take shape. Much of the joy of the architecture is inside however, so don’t be put off by a long queue to get in because it really is worth the wait. This building never fails to offer you something new every time you visit. This is partly because construction of the church is now continuing rapidly, but also because so much time has been spent on every intricate detail, from the stone carvings, to the doors, to the ceilings, to the towers and now to the stained glass too. We could spend all day wandering around, but there’s no doubt that visiting Sagrada Familia is a much more pleasant activity when there are fewer tourists around. If you can, we’d recommend going out of season, on a quieter day like a Monday or be there first thing at 9am when it opens. Once you get inside, you’ll find another queue and charge for the lift up the towers and this is usually a long wait. Make no mistake, the view from the top is stunning, but you have to weigh that against the time you have to wait to get in the lift. In peak times it’s not unusual to be in line for 2 hours. Basilica de la Sagrada Familia is open from 9am to 6pm from November to February, 9am to 7pm in March & October and 9am to 8pm from April to September. Basic admission is 15 Euros per person, but children under 10 are free. A ticket including the towers is 29 Euros (2016 prices). 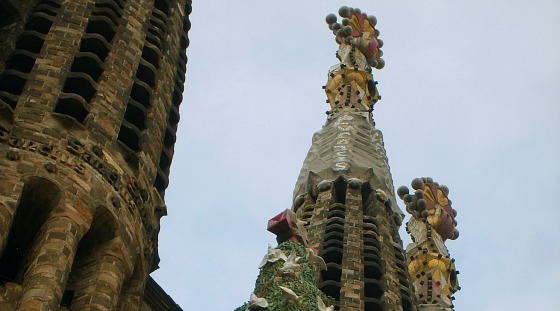 There are a number of tours which call in at Sagrada Familia on our Tours & Activities pages including the top-rated Artistic Barcelona Afternoon Tour. 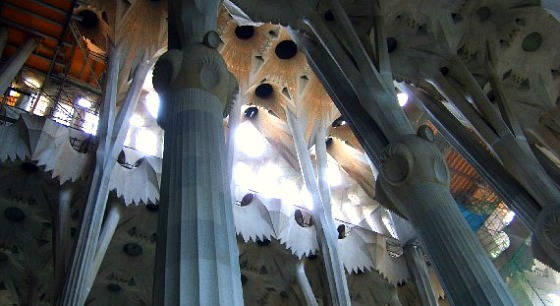 Address: Basilica De La Sagrada Familia, Calle Mallorca 401, 08034, Barcelona. Getting to Sagrada Familia is best done on the Metro to the stop of the same name, or alternatively you can use the Hop-on Hop-off Barcelona Tour.